Outside right now, the weather has turned rainy and unusually cold for New York at this time in May. But somehow I feel it's appropriate. The sky is dark, where a once-bright light has been removed from earth. There are puddles where the rain has been falling since last night, and I feel that God has shed some tears today. I came home yesterday to a message from Houston, Texas, and the voice on the answering machine conveyed the sad news. "Cal Thomas passed away today". I only knew Cal from a brief time, having met him just a few short years ago. And 10 years ago, I had no idea who he was. But he touched my life, and he touched the lives of millions of people around the world who will, sadly, never know his name. I can't remember when I first heard "Tighten up" by Archie Bell and the Drells. It seemed like one of those songs that I always knew. Probably because it was a huge hit when I was a kid and sounded like one of those songs that just always existed. But I do remember when I first heard of the TSU Toronados. A friend of mine from California called me up to tell me he'd just met the owner of Ovide records in Texas, a man named Skipper Lee Frasier. And after I admitted to not knowing anything about either the label or the owner, I was informed that it was the first label for "Tighten Up". 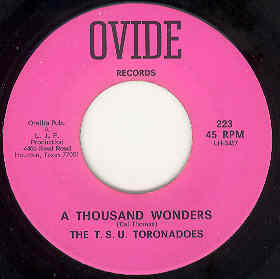 I then learned that the band that created and played the song wasn't the Drells at all, but this group called the TSU Toronados. And then I learned that the main man behind that group was a fellow called Cal Thomas. And then I learned that they'd done much more than just play back-up for a single song, even if it was a stone-soul classic. I've met a lot of bitter and cynical people who, for whatever reason, never achieved commercial success in the music business. And before I met Cal, I would have assumed that he was one of them. He and his band, despite creating a million selling record, never received much recognition. And they certainly didn't receive any money. To be so close to fame and fortune, so close they could almost taste it, so close to those who did benefit from their talents, but not close enough to reap the rewards, must be a gut-wrenching disappointment. But when I finally did meet Cal, I was pleasantly surprised to find a humble, down-to-earth man. He didn't betray any bitterness toward his lot in life. He just chalked it up to inexperience and bad luck. My first and lasting impression of him was that he was someone who persevered. No matter what happened, he just kept moving forward. He kept striving. Even if "Tighten up" were the only record Cal had ever been involved with, his place in history would certainly merit more than a mere footnote. But he did do more. He crafted intelligent songs with complicated melodies and played a mean guitar, too. "You're Mine" and "A Thousand Wonders" are stand-outs for me. And on top of all that, he was a gracious host to me when I met him. He invited me into his home and into his life. I will never forget you, Cal.